Concerns are being raised over the capability of the distribution grid to handle large inputs from renewable resources, and the lack of grid-connected energy storage. Which storage technology do you think shows most promise? Flywheel storage systems were the favourite among responders to our poll last week, with 44 per cent of the 740 respondents saying that they showed the most promise. Pumped hydroelectric storage was the second choice, on 34 per cent; these two received by far the most votes. Of the minor choices, cryogenic storage and thermal molten salts tied on 8 per cent, with redox flow batteries on 6 per cent. We received several emails asking why hydrogen generation and storage was not included as an option; this was an oversight. Pleaselet us know if you think this would have been your favoured option. It is good to see that there is so much interest in how to utilise the non-reliable generating sources. Storage of energy at large scale has long vexed engineers. The only proven storage-technology is pumped storage. This is available technology and well proven at large scale (e.g. Dinorwig and Cruachan). Compressed air storage has also been trialled at scale, but needs further R&D. Chemical conversion looks attractive, but how far is it developed? Fly wheels are limited in capacity and unlikely to be large enough to store the TJs of energy that need to be stored on windy days or nights. check out my Velkess invention which takes flywheel energy storage to a new dimension. At 80%+ efficiency, it competes comfortably with hydroelectric storage and can be used virtually anywhere. Prevention is better than cure, and the only way to prevent the inconvenient over-production of renewable electricity is before-generator energy storage. None of the options listed are designed to do that, with the exception of molten salt, if it’s used with thermal CSP – hardly viable in the UK, is it? Cold BGES is perfectly practical, integral with marine renewables, because it simply means redesigning the already substantial structures needed to build off-shore wind or tidal infrastructure. Flywheels are a dumb idea. Raised-weight accumulators, with their energy density enhanced by air pressure, would do a far better job. Stop the deployment of any off-shore wind, wave or tidal without integral BGES as its design premise. If you build smart-supply renewables smart grid DMS becomes optional. Many years ago, I recall attending a lecture describing the importance of ‘load sharing’ between countries. This was when the first Cross-Channel power cables were being installed: based upon the fact that the peak loads in France were at different times to those in the UK. I hesitate to ask the question, but what has changed. Presumably the amounts and timings of peak loads in many parts of the world are different to or differing from those of neighbouring countries. As we are now apparently, as a Nation to be in hoc to somewhere else for gas, nuclear technology, oil, LNG, even coal! presumably it will not be beyond the wit of our leadership to connect us to the light sides of the planet when we are in darkness and VV: solving the storage problem at a stroke. I believe it is a well established, that there is enough of everything on our planet for us all….we create the problems ourselves by all wanting ‘it’ -whatever it is, at the same time. Can we not agree to stagger our requirements, using existing facilities more effectively rather than constantly developing new, ones, before we are forced to do so. One thing we tend to overlook in energy storage. What do the Grid / Distribution Operators want? 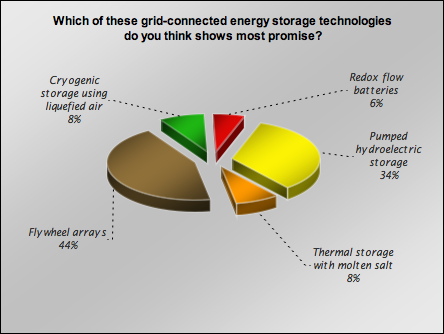 They have wakened up in recent times to start specifying 3 attributes of new grid level storage systems. They require Inertia, VAr injection capability and Ramping. Power electronics can only supply the latter two attributes currently. Inertia is what large steam turbines / generators give us. It creates frequency stability. Flywheels with variable speed gearbox driving synchronous generator with appropriate control system can provide all of these, as well as being capable of providing storage, frequency regulation, etc. etc.. Multiple market capability with one basic design. I chose flywheels over pumped hydro for two reasons. The first deals with a local pumped hydro disaster, http://en.wikipedia.org/wiki/Taum_Sauk_Hydroelectric_Power_Station eight years ago. Fortunately, no one was killed. It has since been rebuilt to higher engineering standards. Other installations need to be upgraded to those standards or built to them. The second reason is that there are few sites suitable for pumped hydro, but flywheels can be more distributed and placed at more sites. Smaller installations also limit the extent of disaster if failure occurs. Pumped storage can be liquid, or solid, since the UK project was announced over a year ago. The main drawback, one has to have land relief available, or have deep shafts mined into the ground. Compressed air (non-liqufied) was also overlooked, and has at least as much potential as some of the other more “techie” means. Another is the direct conversion to magnesium or aluminum, either of which could drive a hydrogen economy. One better – use the energy to drive a synthetic liquid fuels process – then the desired energy density and flexibility of the supply chain is real and permanent. Hydrogen energy storage will leave other forms of energy storage behind. One will be able to store 100 times the energy in a salt cavern than compressed air in a salt cavern or you can store the hydrogen in the natural gas grid. The cost of hydrogen storage will be nearly a fifth of the cost when hydrogen gets scaled up to the 40MW level. Hydrogenics is a leader in this field. I think to even get close to the energy density of diesel, we need to work more on solution like Hydrogen, in the form of sodium borohydride or similar. Queensland uni has been researching this with some promising results. Flywheels can be very dangerous and as pointed out, limited in capacity. I was perplexed by your questionnaire which excluded quite a number of promising storage technologies under development. But you did not include a box for “none of the above”. How was it possible not to include “electrochemical” processes. Leading in that list is lead acid with all its variants. Then lithium ion, appearing at multi-MW scale all over the USA. Just behind, probably appearing within a couple of years will be rechargeable zinc air, like Eos Energy Storage. It was good to see redox batteries in the list but can it make it on price? Buck up there and look outside UK for the many exciting things that are taking place in the rest of the world! This is developing into an interesting line. Looked at Velkess flywheel: it is far too small to store the 25 TJ that would be generated by 1000 MWe wind turbines over-night. Chemical and hydro look most promising to me. Pumped storage being the only proven large scale storage. Batteries have been advocated, but are they really feasible for this scale of storage on cost or performance? Its sad that the UK did not use HV DC generation for reduced distribution costs and easier application to electrolysis. Really it looks as though capacity-factor payments are just going to add to our bills….unless there is a will to solve the problem of storage. There are more than thirty million petrol/diesel fueled vehicles in the UK, a billion or so in the world. If just 10% of the UK fleet of petrol/diesel motor vehicles were (converted to) pure electric vehicles each with batteries of say 16kWhr capacity, that would provide some 20GWhr of electrical storage capacity in the UK. By 2050, when hopefully we will all be weaned off fossil fuels and driving EVs, that capacity could have grown to some 200GWhr. It would seem to me, please correct me if I am wrong, that it should not be too dificult to introduce intelligent EV charging systems (programmable via your mobile phone so if for example you want your EV to be 100% fully charged by a certain time of day that will give this priority over any other demands). This would allow this enormous EV battery electric power storage capacity to be managed remotely and automatically by telecommunication from the National Grid control centres. Individual EVs plugged in to the grid and parked at home, at offices or at railway stations, airports etc or wherever and not being used could provide both a sink for excess power over demand from intermittent power generators and could also provide power back to the grid (with the EV owner being paid for the power supplied to the grid at attractive peak power rates) during periods of peak demand. Alternatively with the vehicle plugged in at home the vehicle battery could whne required supply power to the home (if pre-programmed vehicle usage allows) such that when demand from the grid is very high such as for example when all the kettles go on at half time during a football match or at the end of Strictly then the power required is automatically taken from the venicle battery and not from the grid. Note that a fully charged 16kW hr EV battery is equivalent to 16 x 60 = 960 kW minutes. A 2.5 KW kettle takes around 2 minutes to boil so uses only 5 kW minutes of power so is a very small demand on the vehicle battery and it will will take only a few minutes to recharge the vehicle battery when the peak grid demand has passed. Conversion of existing vehicles to electric power is not at all difficult as you will see if you spend just a few minutes searching on google. There are millions of roadworthy, bodily sound small vehicles on our roads today that could easily be given a new electric lease of life when their internal combustion engines, exhaust systems, catalytic converters, water pumps, radiators etc reach the end of their economic lives. Your local garage could easily do the conversion in a few days if they were given the conversion kit and installation instructions for your particular car from a prototype developer. The more the demand the cheaper the cost. We had the scrappage scheme offering £2000 incentive to scrap your car and buy a new one. More EVs on our roads would provide the push required to invest in greater numbers of high rate EV charging points at motorway service stations and elsewhere around the country and hopefully encourage investment in dynamic electrical vehicle charging systems along motorways and trunk roads as discussed previously on these pages.